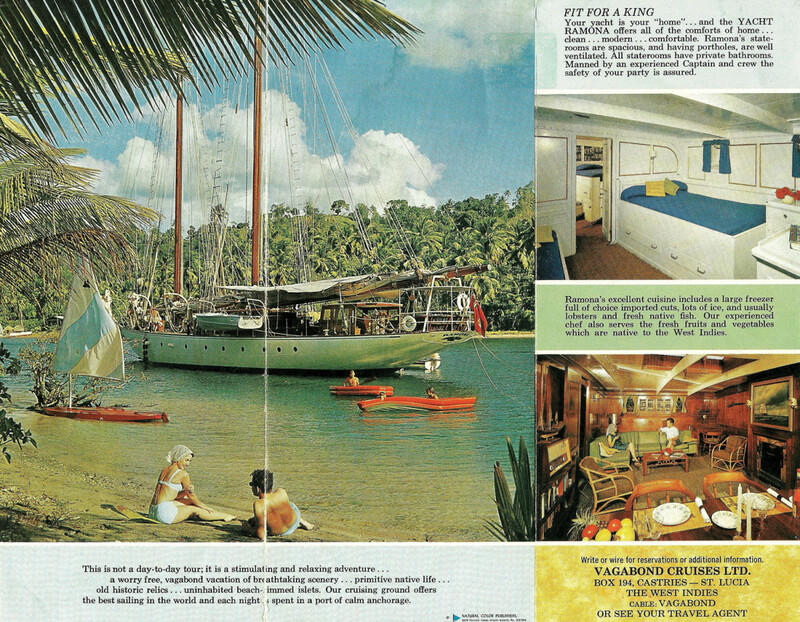 A charter brochure for Ramona shows off her lovely lines and fine accommodations, though not a modern sensitivity to life in a less-developed country. The Virgin Islands lie just east of Puerto Rico, stretching some 40 miles from the west end of St. Thomas to the wreck-strewn reefs off Anegada. 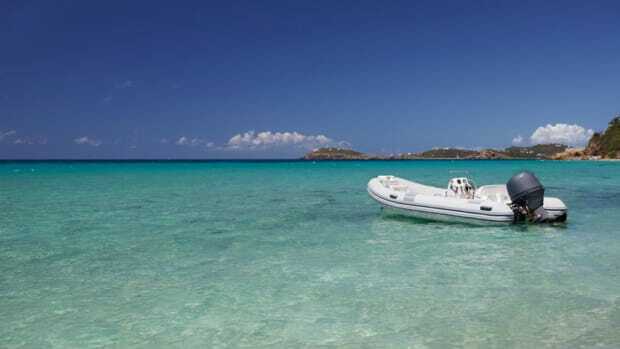 This beautiful archipelago offers easy sailing and safe anchorages. In the ’60s, a few small restaurants were in the palm-fringed bays, and we found the area to be a cruisers’ paradise. 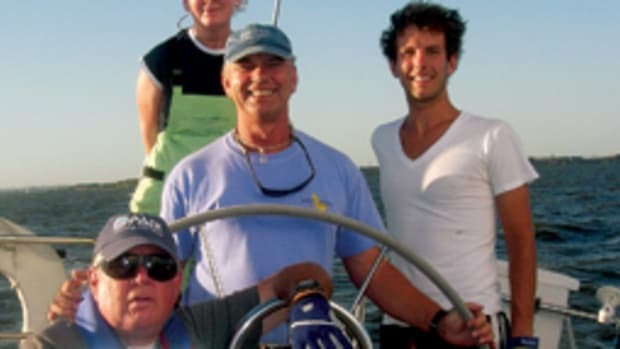 Our charter clients enjoyed fair winds, calm passages and a minimum of mal de mer. 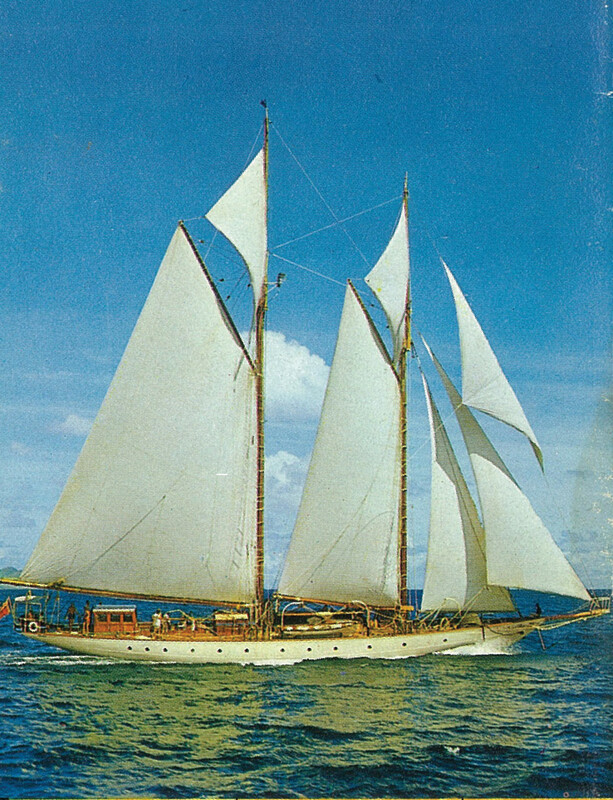 In August 1966, I was a deckhand on the 138-foot schooner Ramona, crewing for my father, Capt. 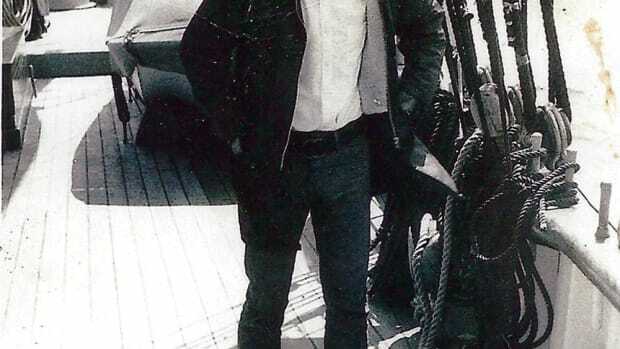 Walter, during Virgin Islands charters. As the yacht lay anchored off Charlotte Amalie, St. Thomas, we prepared for our next cruise. 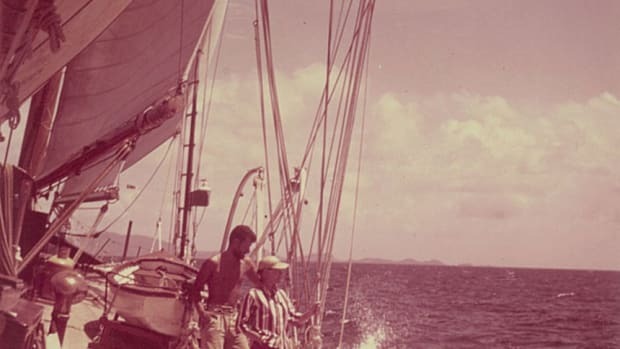 Ramona was a hive of activity, with 10 crewmembers polishing brass, scrubbing the teak decks and dressing up the accommodations. Uniforms were sent to the laundry, and the cook made countless trips to the market. The day before the charter, we went alongside the dock for an hour to fuel and top off our water tanks. 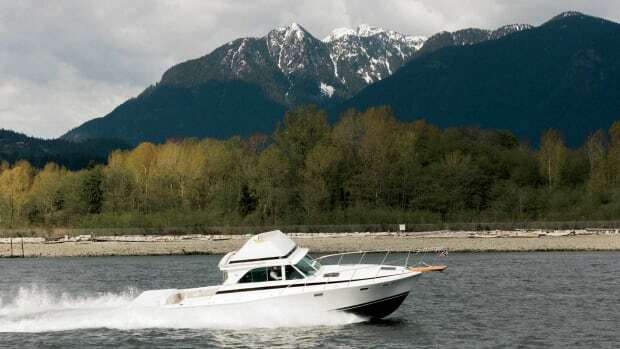 At 9 the following morning, two other deckhands and I took a tender to the marina dock. Dressed in our white T-shirts with Ramona emblazoned across the front, we met our charter party of eight. We escorted them and their luggage aboard and ferried them to the waiting schooner. 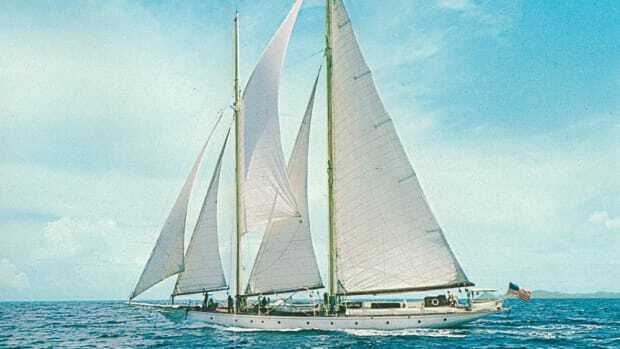 I drove in a large circle to starboard before bringing the launch gently alongside the boarding ladder so that our guests could have a look at Ramona’s long, sweeping lines. The morning sun reflected off the water to play on her white hull. From the club burgee on the main topmast to the red British duster on the stern, Ramona looked smart and ready for sea. The steward soon had our party settled in their staterooms, and we headed out. By noon, we were along the southeast coast of St. John with the Anegada Passage to our south. We were bound for the Treasure Point anchorage at Norman Island, where we planned to lay over for the night. Without a breath of wind, Ramona was rolling quite a bit. 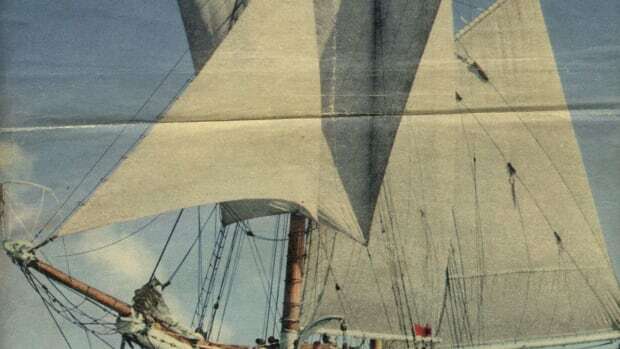 There wasn’t any point in putting sails up, as the gear would have just slatted around. Our charter party was a friendly New York family by the name of Rabinowitz: a father, mother, two sons, their wives and two grandchildren. As we powered along, two of the men trolled a fishing line over the stern while the women sunbathed on deck. The kids played cards in the pilothouse. The warm Caribbean sun beat down as we made our way slowly over the mirror-like sea. An occasional fish broke the surface, chasing some unseen prey, and schools of silvery flying fish jumped clear of our bows. Sometimes they traveled a hundred yards or more before plopping back into the blue sea. Quite often, the 10-inch-long fish would mistakenly fly aboard the schooner. Although this happened more during the night, we would occasionally watch them flop onto the deck during the day — and bring them to the cook to fry. 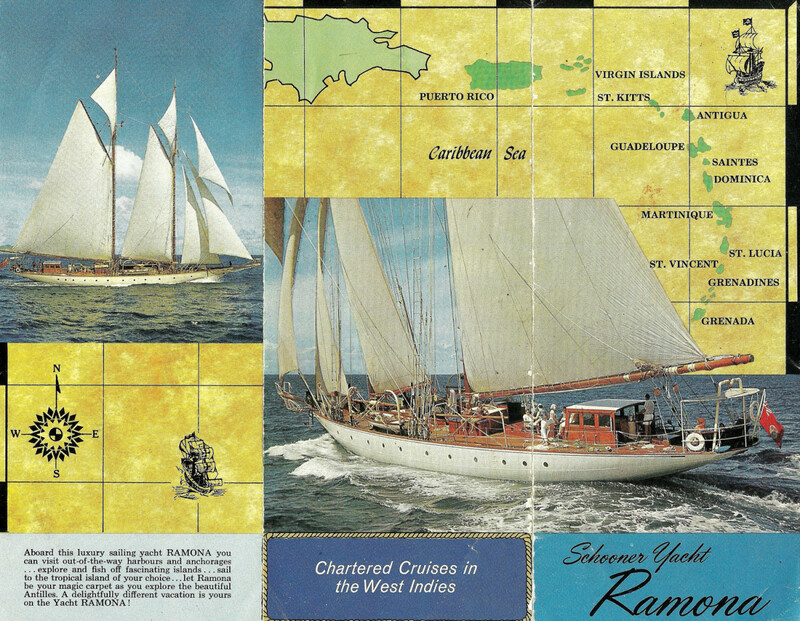 Ramona was a 138-foot schooner owned and operated by the writer’s father in the Caribbean. Mrs. Rabinowitz was in her 50s with certain assets that were wont to overflow her blue-flowered bathing suit, despite her hopeless attempts to corral them. That afternoon, she was on a deck chair to port, near the rail. She teetered quite a bit each time Ramona took a roll. I lashed the bottom and top to a stout caprail stanchion. “Why, thank you, young man,” she said, batting her eyelashes. Mrs. Rabinowitz was appreciative, but as I walked away, she let out the most horrible howl. I looked back and saw her fall from the chair to the deck, where she lay on her back, waving her arms frantically. I stooped over her but couldn’t determine what was wrong. I tried desperately not to look at her cleavage, but then I saw it: the tail of a flying fish, stuck in there, wiggling like crazy. The captain, still aft at the wheel, was growing impatient. “What the hell’s going on there, Lou?” he called out. I pointed to her breasts. My father frowned. He was puzzled. Mrs. Rabinowitz waved her arms and cried out. I grabbed the little fish by the tail, but every time I pulled, it wriggled farther down. There comes a time in every boy’s life when he just has to take the plunge. I took a deep breath and jammed my right hand in there to get a proper grip on the slippery little fellow. My arm ended up elbow-deep in her bathing costume. Just at that moment, of course, Mr. Rabinowitz came down the deck. I kept clear of Mrs. Rabinowitz for the remainder of the cruise, but whenever I accidentally caught her eye, she would smile sweetly and give me a wink. 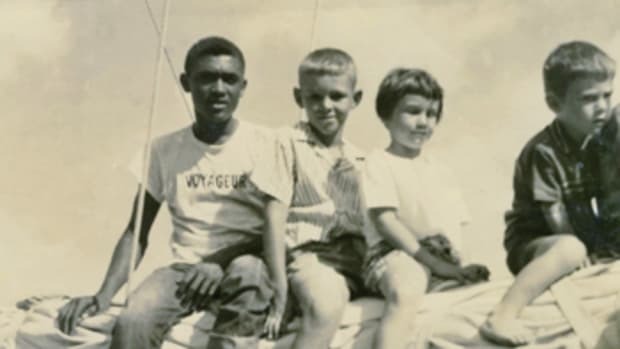 My mother made the most wonderful West Indian banana bread, and she made sure the schooner’s cook had the recipe. I ate quite a few slices of this bread that fishy day. It’s called bread, but it is actually a sweet cake. Combine the butter and sugar, creaming until fluffy. Add the egg and sour cream. Mix well. In another dish, combine the dry ingredients. Add to creamed mixture a spoonful at a time, along with a little banana, mixing well after each addition. When you have all the ingredients combined, add the lemon juice, stirring until blended. Spoon into a greased or nonstick loaf pan and bake for 50 minutes at 375 degrees. Place on a rack to cool.